According to Social Fresh videos on landing pages increase conversions by 86%. Internet content is always changing and you have about 8 seconds to convince someone to stay on your website. This is why you need to catch people’s attention. Videos will not only help you to have more visitors but will also let you prove how useful your product or service is by product demonstrations or client feedback. The way to do this is with the third most visited website in the world: YouTube. First of all you have to know what YouTube is. This is basically a video hosting site where everybody can upload and share their videos whatever the content. 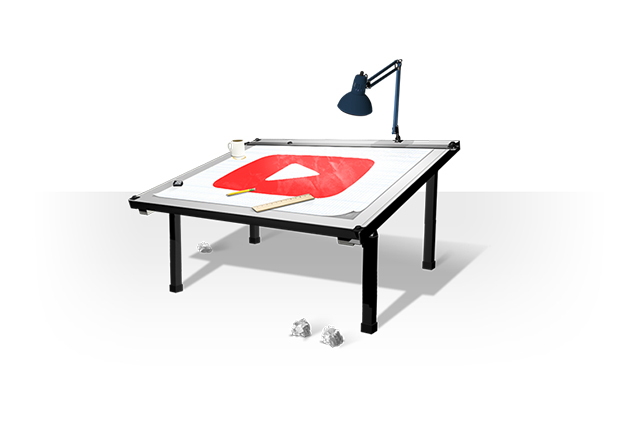 Both professionals and individuals have access to YouTube content, so let’s see where to begin with this essential tools. The first thing to do is to create an account on YouTube for your company. For this, create an account on Google thus you will be able to have access to all Google Applications such as Gmail, YouTube, Google +. This part is not complicated you’ll just have to fill a form with your data. 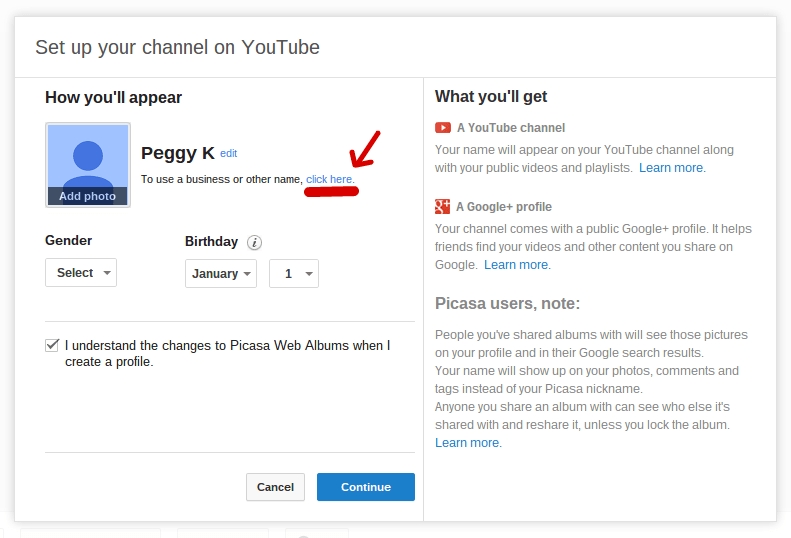 Now that you signed in on YouTube with your Google login and password click on ‘My Channel’, a window appears, do not click Ok but click on “To use a business or other name”, there you can put the name you want, but don’t a name which is too complicated since you want the customer to find you quickly. Congratulations you are now on your YouTube dashboard! So you’ve got a Google and YouTube account, now every time you’ll sign in on YouTube you’ll see an “upload” button on the top of the page just next to the search bar. Click on this button and select the file from your desktop. While it’s uploading, provide information about your video since it’s always better when viewers know where it comes from and what the topic is about. The title has to be appealing and clear to make viewers find it easily. Indeed the title represents between 80% and 90% of your visibility. The description is also important as it will let you talk about the video. No need to make it long as normally everything is on the video but you can give some details about the company and adding your website link can be beneficial. A very important point is the tags, make sure they are suitable to your video, since this will help your clients to find you more easily. You can also choose to publish the video straight away or schedule it for later. This point is a little bit obvious but it’s quite important to mention. If you’re uploading a video that you found on other website don’t forget to add the copy right. Even if YouTube is kind of cool with it, as a company you have to obey this point just because a penalty is never good for your image! As a professional, you obviously know that you have to monitor your competitors, knowing their offers, products and behaviour. It also applies to YouTube. Have a look to what your competition is doing and simply try to make it different. Making a video is the opportunity to get off the beaten track. You can be less formal and make a topic funnier. And remember it is always worse to bore a customer than shock him/her a little bit. Go through your YouTube channel every day, checking what kind of feedback you’re getting from people, replying to comments where necessary, and planning your next post. Keep your content relevant, making sure that it fits in with your business’ field. Run a google search and see what’s new in your market. You have to make customers want to see more and make them look forward for the next video! Even if you are working on on-line marketing or as a community manager and you know a massive quantity of visibility strategies, do not hesitate to learn more and more. You can easily find good tutorials on How To get More Views On YouTube for example. We learn something every day and professional advice is always welcome. ‘Share’ is the main word of this century, of course you will share your video on YouTube mainly, but you can also add a link on your website, blog etc. The more you share it the more it will be watched. The goal is for the viewers to share it again as a virtuous circle. Sometimes you can’t quantify the impact of your activity on your audience according to the media you’re using but on YouTube you’ll have exactly the numbers of views. Then ask yourself, ‘which kind of video is more successful and gets the more views over my different content?’ If you see that a special kind of video is not appealing, stop doing it, you’ll waste your energy. Take benefit from your successful productions and try to use the style for other videos.